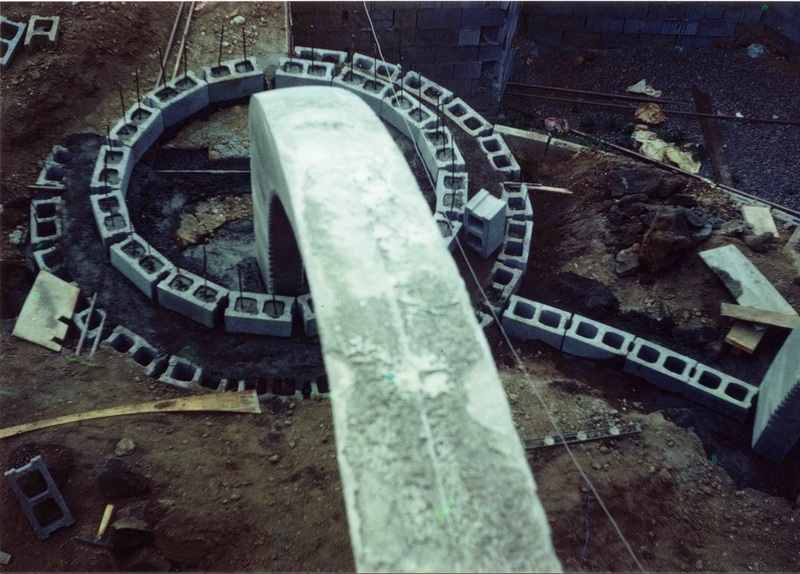 Cinder blocks delineated the retaining wall for the pool, and the circular shape of the living room. 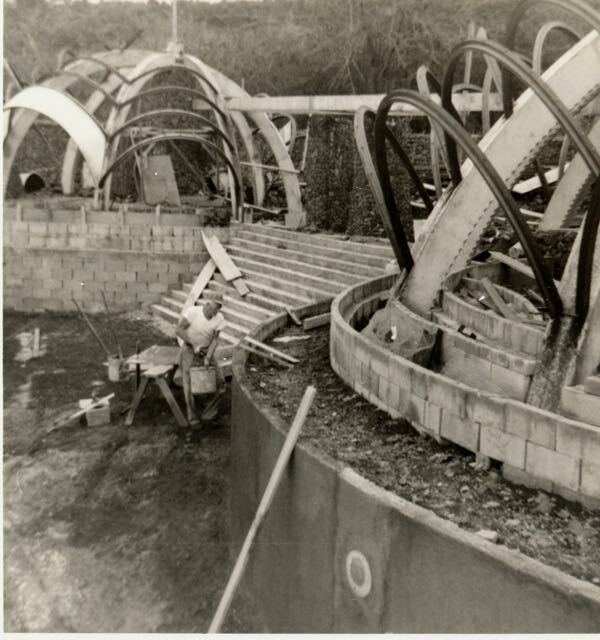 Kendrick Kellogg worked 'hands on' during every step of the construction, from building the walls to laying the tile. 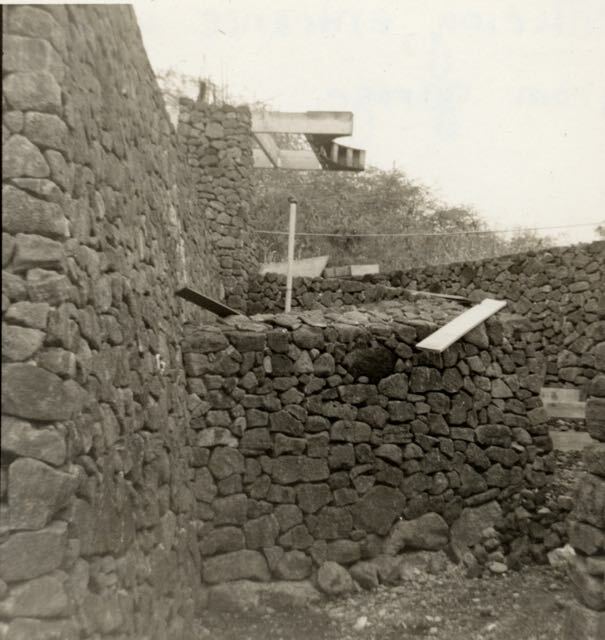 The lava rock terrace was inspired by native Hawaiian temples, or 'heiau.' 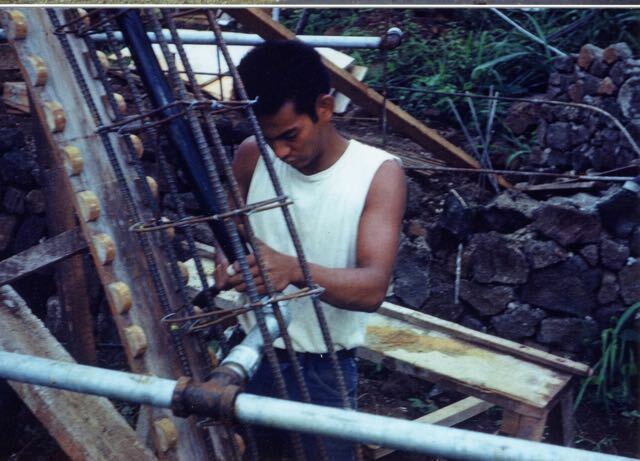 Notice the cinder block structural reinforcement. 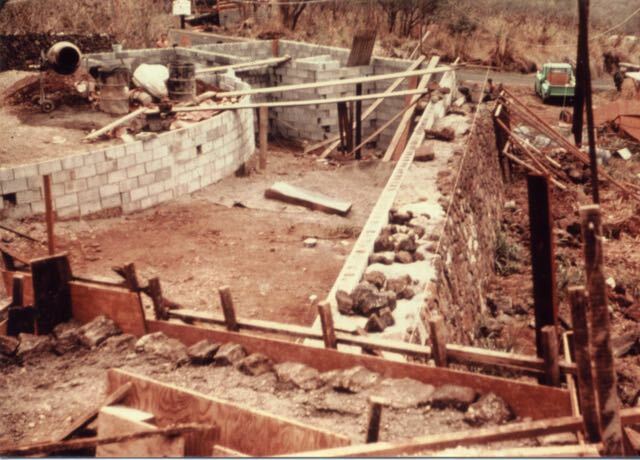 Cinder block walls formed the inner walls of the 70' pool. 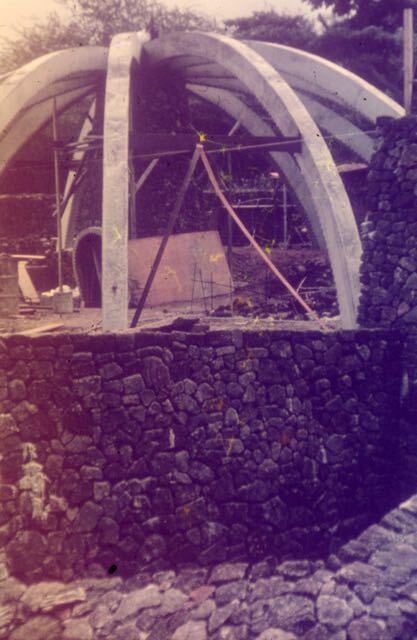 A small cement mixer, shovel, wheelbarrow, and pickup truck were the basic tools, back in the days when building materials, stained glass, tiles, tools and appliances had to be assembled and barged in from California for the project. 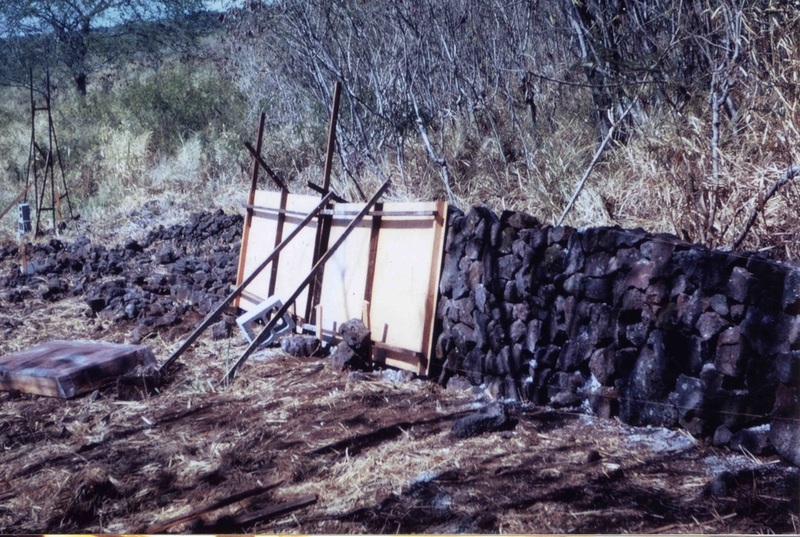 Few construction materials were available on the island, except for lava rocks and koa wood. 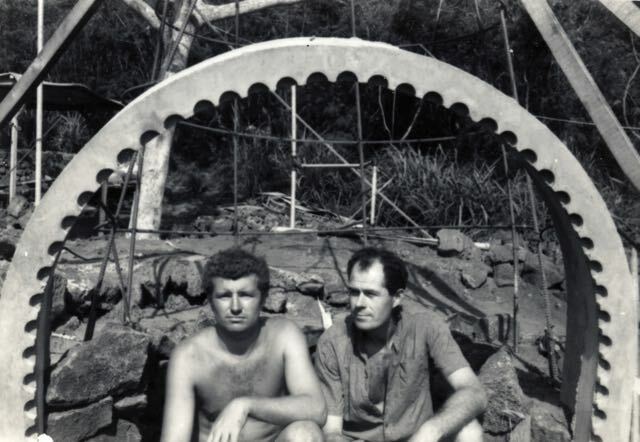 Kendrick Bangs Kellog (left) was assisted throughout the project by Bill Slatton, who had done metal work for Frank Lloyd Wright at Taliesin West. 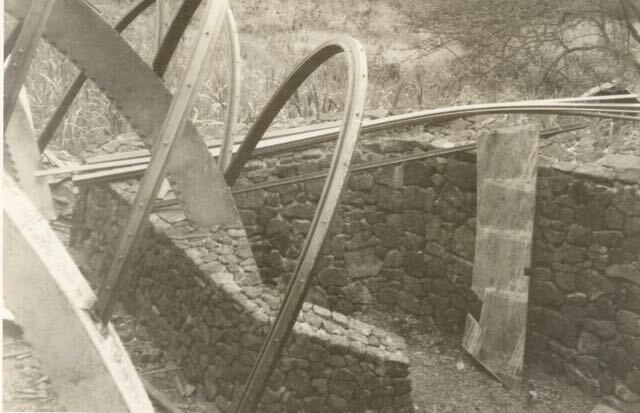 Slatton created the metal work at the Onion House, including the entrance gate and spires. 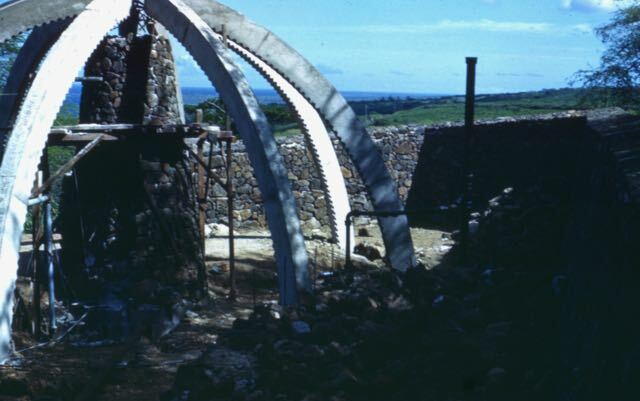 This arch would become the living room fireplace. 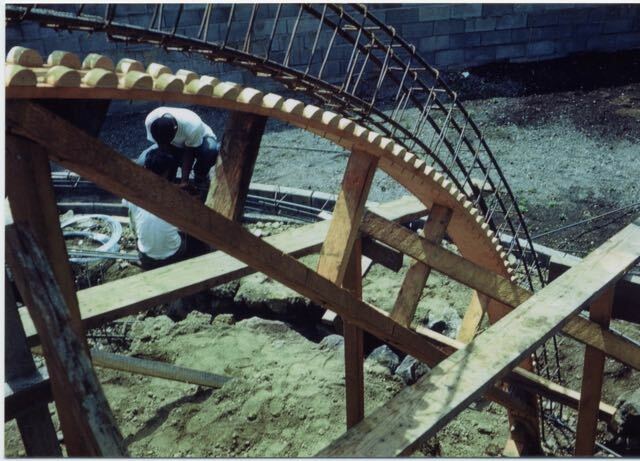 This shot shows the arches beginning to be shaped with wooden forms. 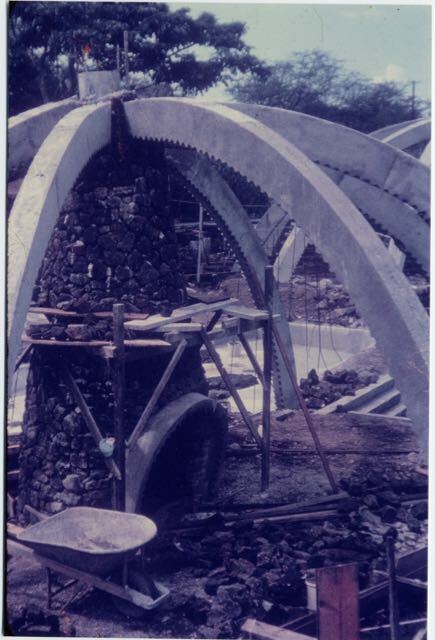 This shows how the forms were created to cast the concrete arches in place, reinforced by rebar. 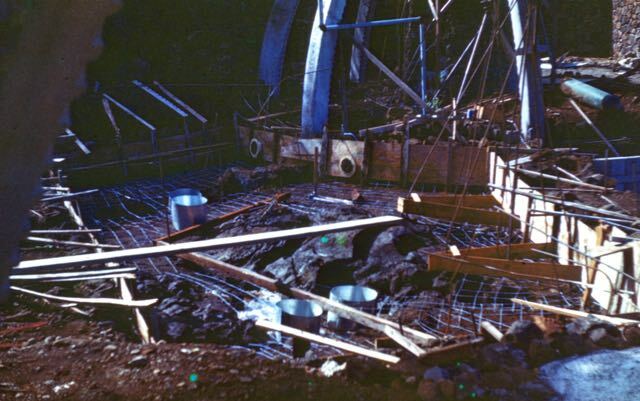 Preparing for the concrete pour. 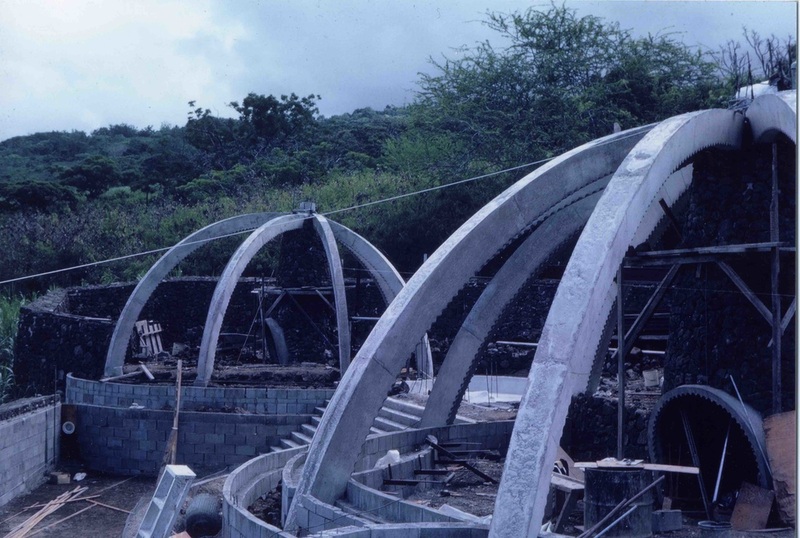 Plywood forms created the concrete arches. 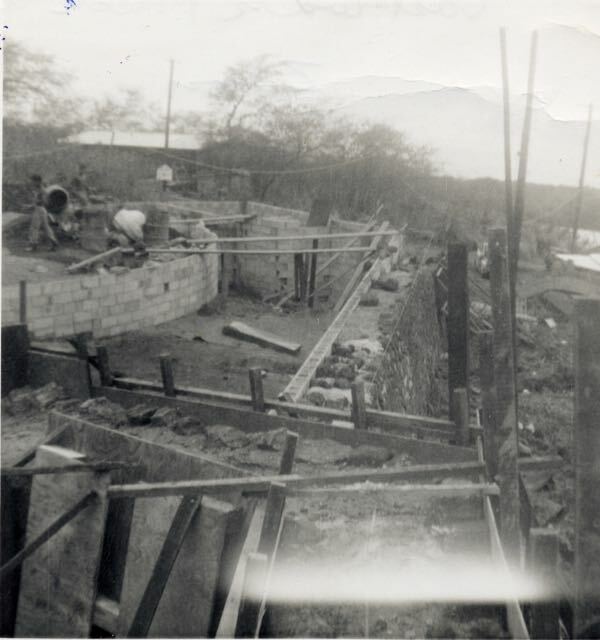 Living room viewed from the rock walls by the entry steps, just after the concrete arches were poured. Cinder blocks form the fountain and the low wall delineating the living room. Master bedroom viewed from the lower lot. 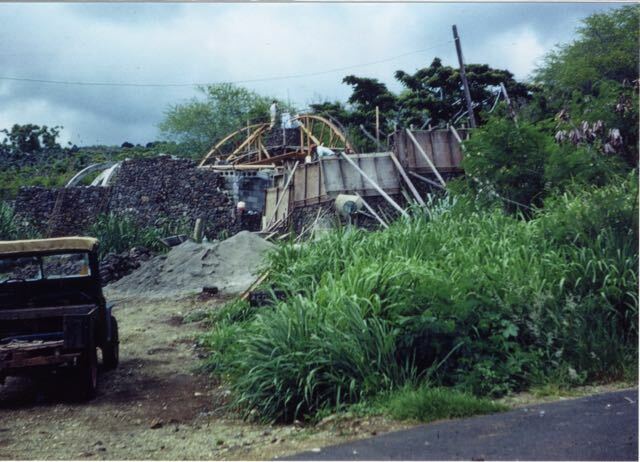 Notice the lava rock chimney in progress. 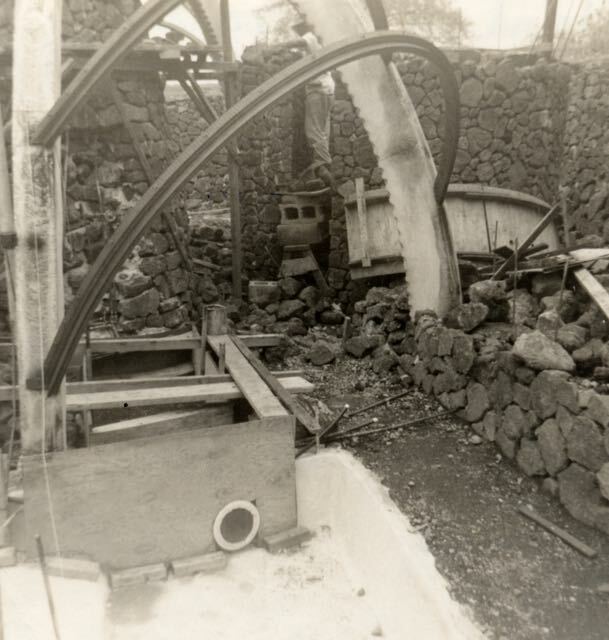 After the concrete arches of the living room were poured, the lava rock chimney was extended upward. 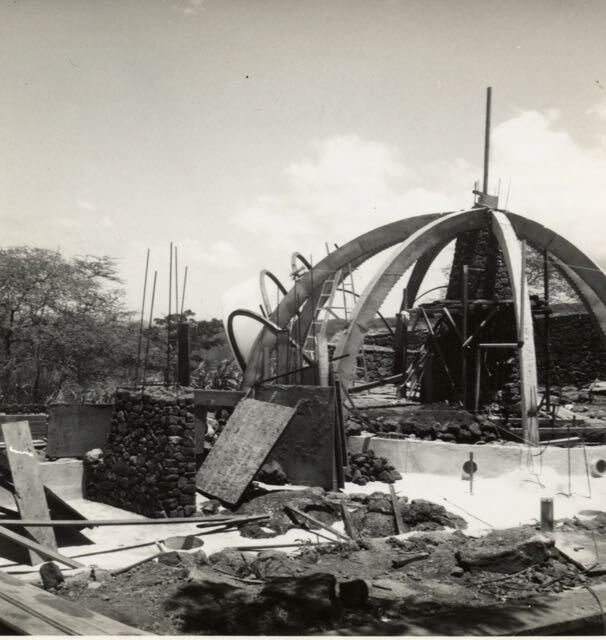 At this point, the concrete arches for both structures have been formed, the lily pond has been poured, and the swimming pool is lined with cinder blocks. 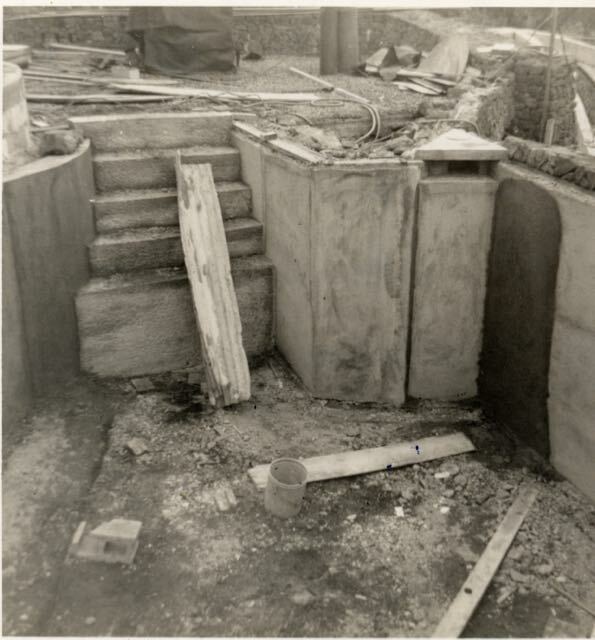 The master bedroom takes shape, with the lily pond and pool steps beyond. 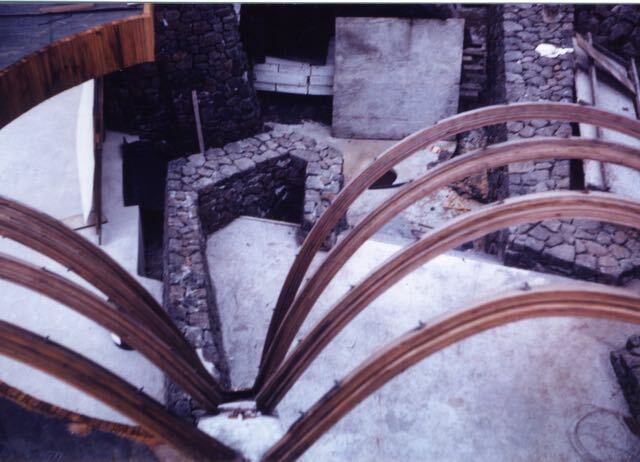 The zen garden off the master bedroom takes shape as the arches are formed, in preparation for the fiberglass. 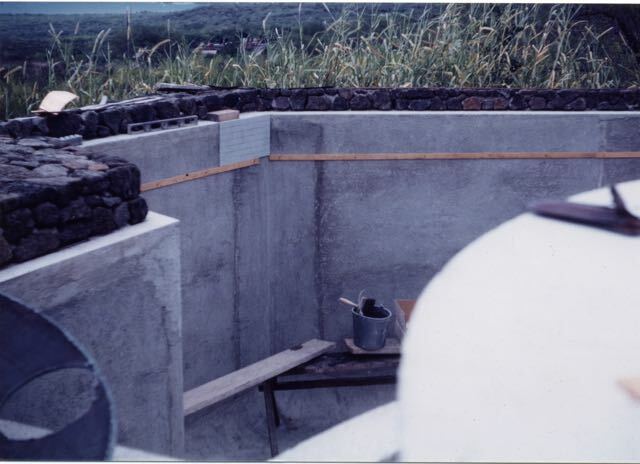 The master bath was formed by building a lava rock semi-circle. 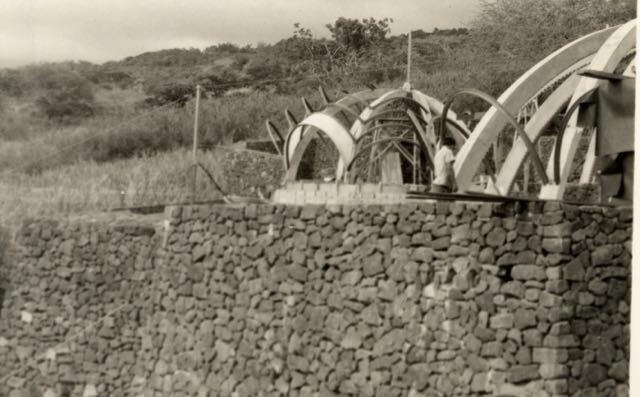 Notice the niche for towel shelves inset into the lava wall. 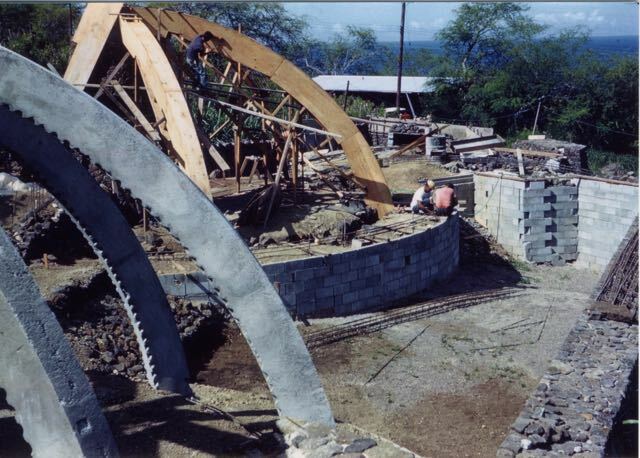 The lava rock circular wall forming the master bath takes shape. The pillars to hold up the overhead canopy are started, and the first fiberglass panel was begun. 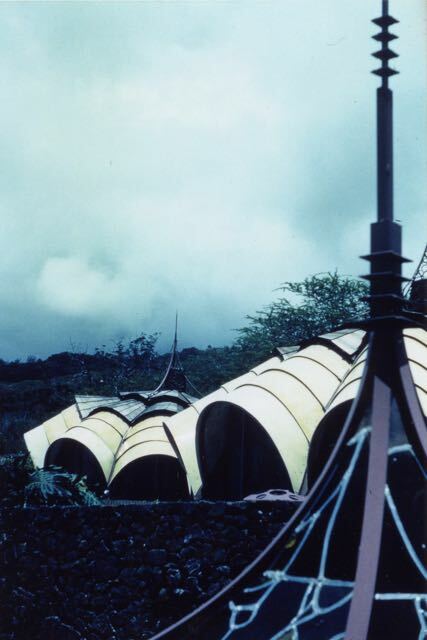 Both lava rock pillars were built, and the canopy over the walkway began to take shape. 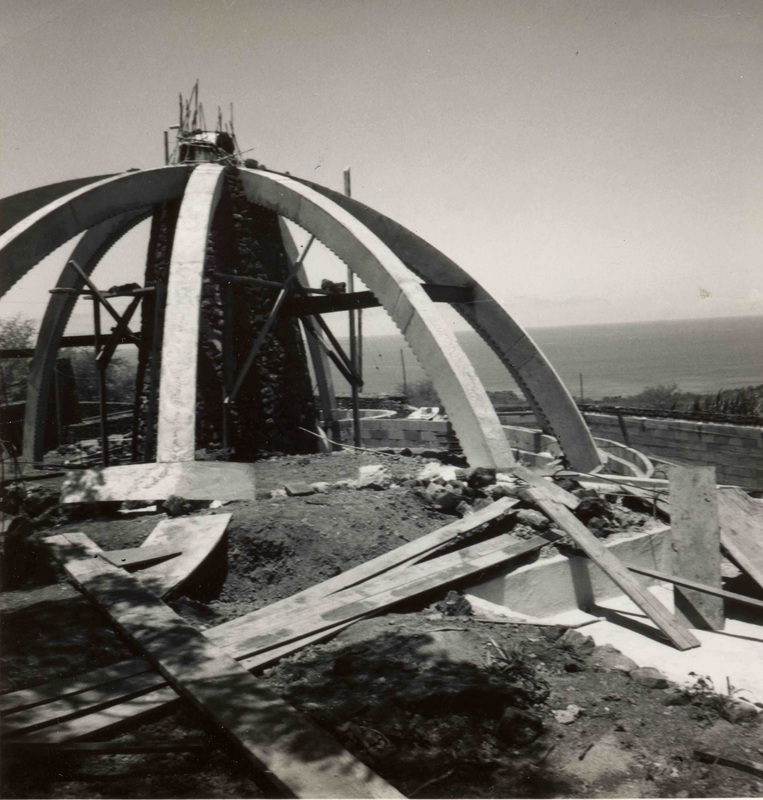 The first fiberglass shell has been constructed, and the overhead canopy is taking shape. 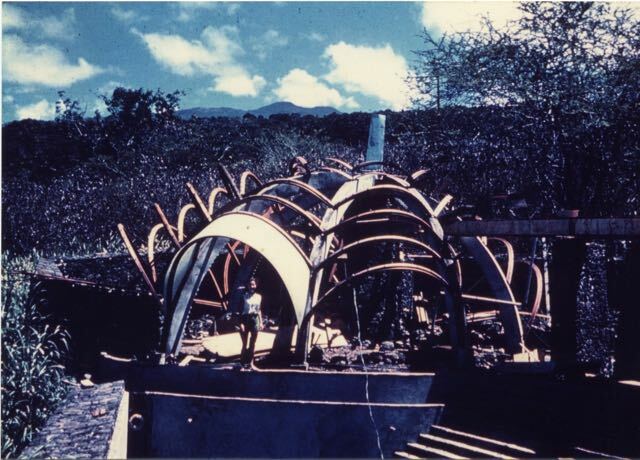 The master bedroom was the first to get its arches and the first fiberglass panel, while the main structure is just beginning to be formed in this photo. 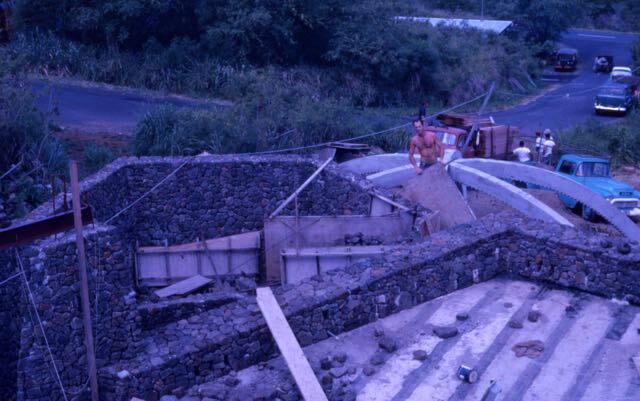 When the barge was loaded with all the construction materials needed for this project, swimming pool lights were overlooked. 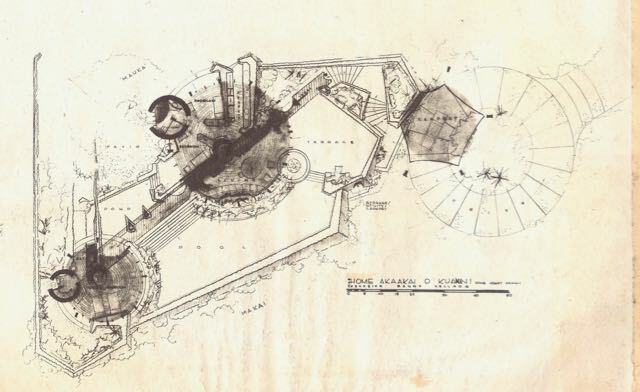 The architect improvised by using 12 volt car headlights! 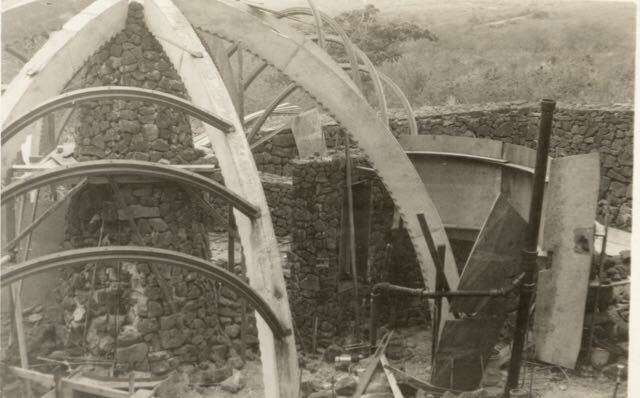 Someone stood where the roof would soon go to get this shot, looking down the arches to the planter and lily pond. 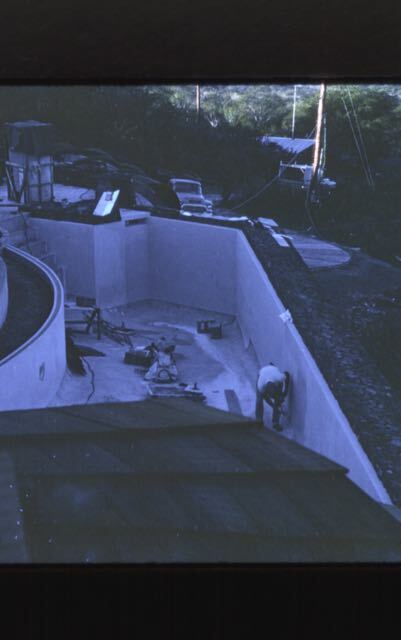 Sides of the swimming pool are poured. 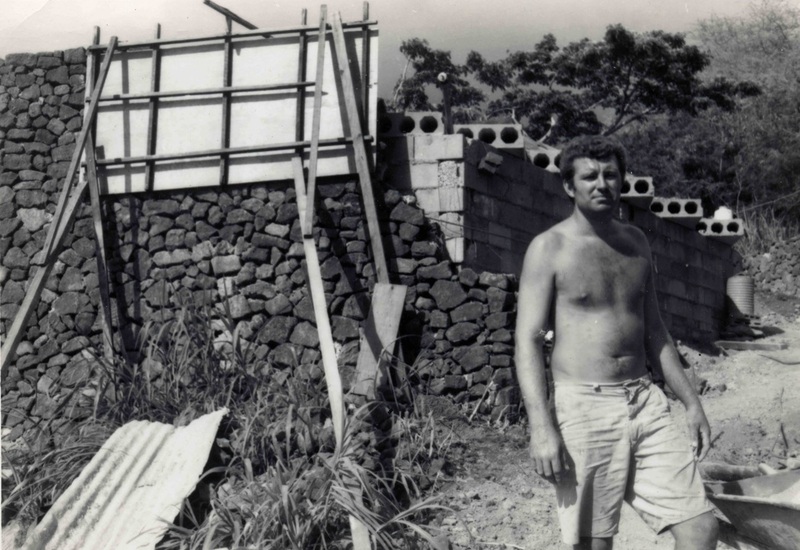 Bill Slatton engaged in building the lava rock walls to form the entrance. The first beam for the overhead canopy at the entrance has been placed. 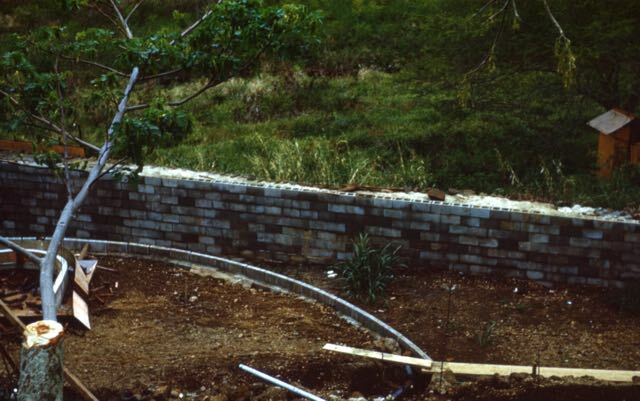 Rock walls form the planters by the entry. 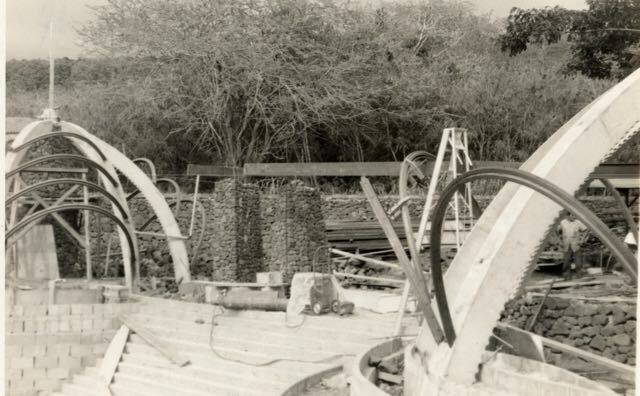 Note that the entrance steps are yet to be formed. 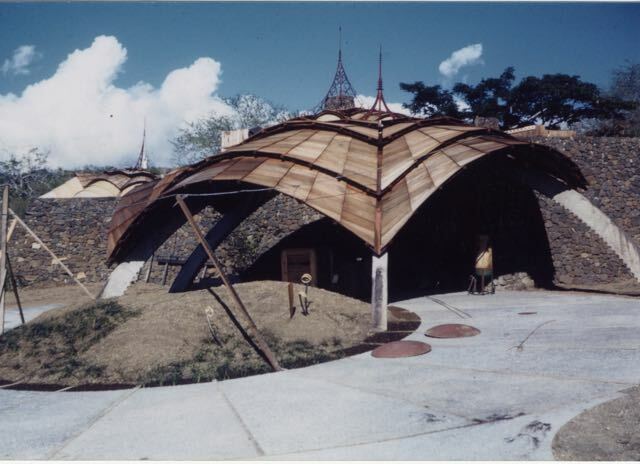 The canopy is under construction. Wood shingles are added, as the sides of the pool are being finished. The first tile is laid for the swimming pool. 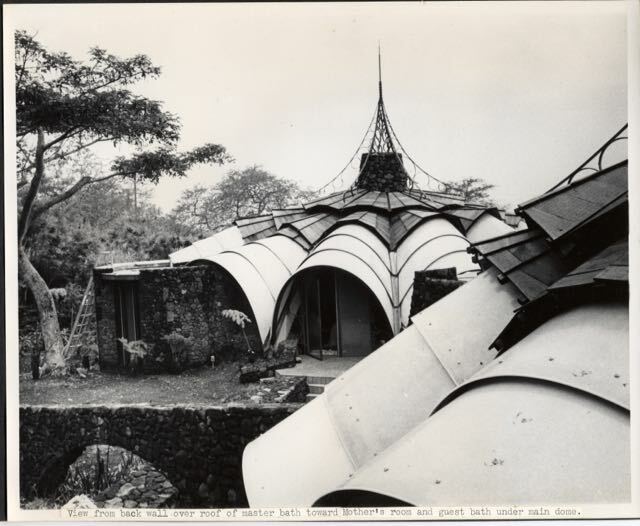 This angle could only be taken when the Onion House was new, because the foliage would soon obscure this view, taken from the top of the carport. 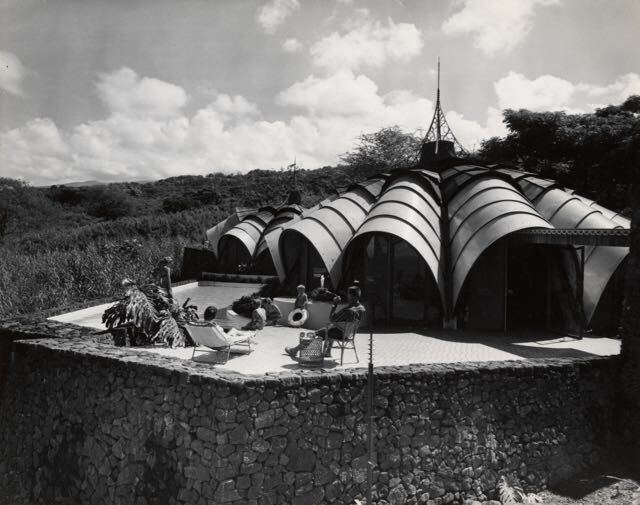 The Onion House in 1962, when it was new. 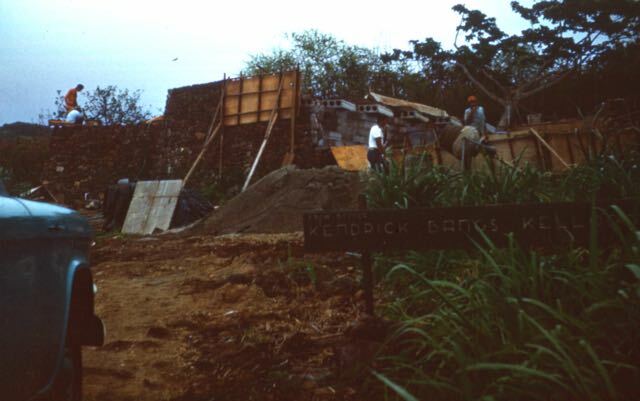 The brand-new back yard before it was softened by lush foliage. 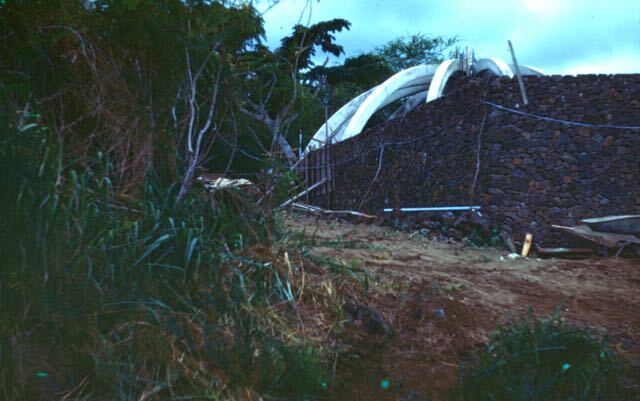 Notice the lava rock arch. 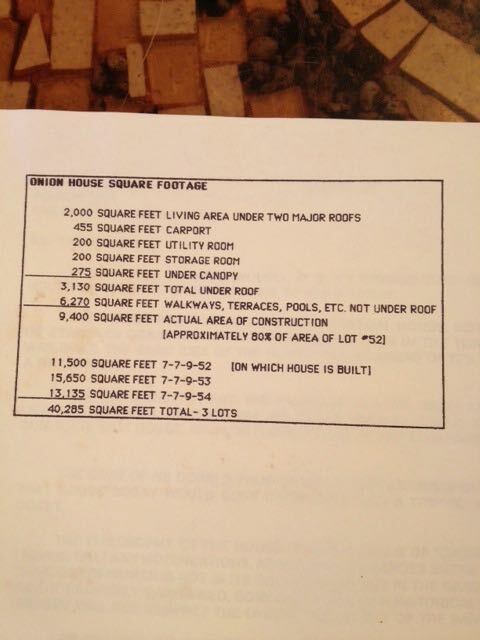 The carport when it was new. 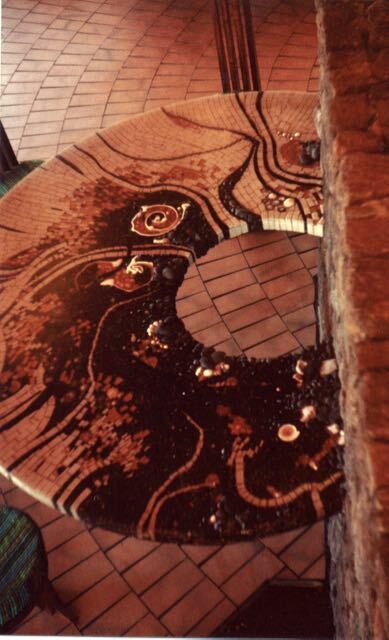 Mosaic dining table, created by James Hubbell, who also did the free-form stained glass windows.